James Rogers set up his practice at High St., Tullamore in 1908 or 1909. Following his appointment to the post of county registrar for Offaly in 1926, his partner in the firm James A. Ennis took over its management. In a neat swap, Ennis succeeded Rogers as county registrar in 1943 and Rogers returned to private practice at Rogers & Co. Eugene Hunt took over the firm in 1967 following Rogers death but it was wound up by the Law Society in 1982 due to Hunt's bankruptcy. James Rogers of 12 Lower Ormond Quay, Dublin and Tullamore was admitted a solicitor in March 1907 and was from Aughamore near Knock, County Mayo. 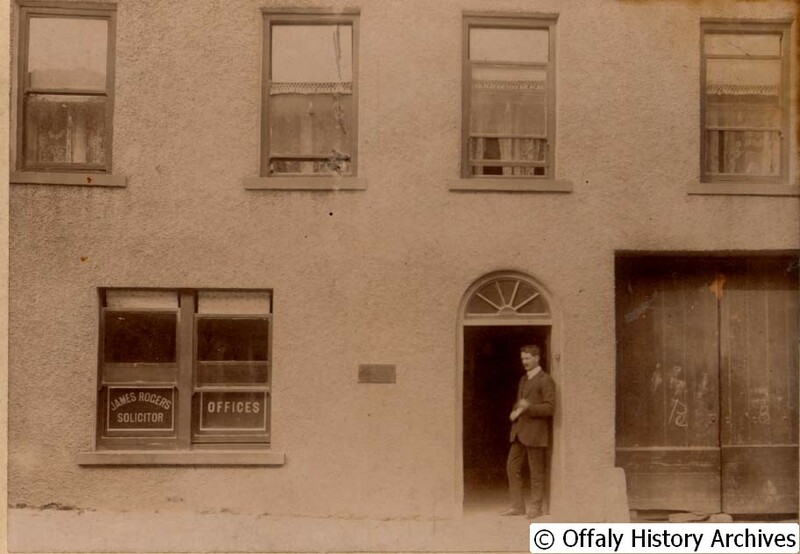 After a short period in the Ordnance Survey Office he took up law and served his apprenticeship with the firm of A & L Goodbody at their Tullamore office. He established the firm of Rogers & Company at High Street, Tullamore, a few doors from where he had been trained probably in 1908 or 1909. He was enthusiastic about the Irish language and culture and was prominent in the Gaelic League and was subsequently employed in defending Sinn Féin prisoners connected with the ‘affray’ at Tullamore in March 1916. Rogers was election agent for the Sinn Féin candidates in 1918 and supervised all funds of the republican loan in County Offaly. He was election agent for the ‘Free State party’ in April 1922 and in 1923 was appointed state solicitor for County Offaly, the position of crown solicitor having been disposed with. Rogers resigned in August 1926 on his being appointed first county registrar for County Offaly. He married in April 1944 Miss Mary J (Mollie) O’Donnell, a daughter of Mr J. Rodney O’Donnell OBE and Mrs O’Donnell of 4 Royal Marine Terrace, Bray and the best man was the circuit court judge, William Gleeson. James Rogers retired from the position of county registrar in 1943 and returned to private practice, conveniently switching place with his old colleague, James A. Ennis. The move may have been for economic reasons in view of his impending second marriage. He had taken a keen interest in local history and was the founder of the Offaly Archaeological and Historical Society in 1938. James Rogers died in June 1967 some sixty years after he qualified. His old firm was closed by the Law Society in 1982 following the difficulties experienced by his successor, Eugene Hunt. James A. Ennis (NUI) (E 1925), a native of Rhode, County Offaly, was educated at Mount St Joseph, Roscrea and later at University College, Dublin and qualified in 1925. A year later he was admitted a solicitor taking first place in Ireland in his final examination. He took over the Rogers practice on James Rogers being appointed county registrar in 1926. James Ennis became a member of the Tullamore Urban District Council in 1932 and later its chairman. Like his father he became a member of Offaly County Council representing Fianna Fáil of which he was a committed member. He was appointed county registrar for Offaly in September 1943 when his old partner, James Rogers decided to give up the registrarship and return to private practice. Prominent in bridge circles he was also a foundation member of the Offaly Archaeological and Historical Society and was its treasurer for many years. James A. Ennis died in March 1983 and is buried at Rhode cemetery. He had retired from the position of county registrar in 1971 but went back into private practice at his residence for a few years following his retirement as county registrar. Auctioneer Liam Keegan donated the collection to Offaly History in the late 1980s as the former Rogers & Co. office in High Street, Tullamore, was being cleared out for sale. The collection consists of 54 bound volumes including letter books, client account ledgers, and cashbooks. The largest series is the letterbooks, which contain carbon copies of outgoing letters sent by Rogers & Co., Solicitors. It is not a full set, with letterbooks from 1916–26 and 1928–30 not extant. Other shorter gaps in the sequence also appear. All letterbooks contain an alphabetical surname index of clients. The rest of the collection is more financial in nature, consisting of series of cash ledgers, client account ledgers, cheques issued ledgers, a costs copying volume and a daybook recording daily work for current clients. The volumes have been divided into their respective series and thereafter arranged in date order. Available by appointment. Produced for consultation in original format with due regard for handling guidelines. Some fragile items may not be produced. Copyright Offaly Historical and Archaeological Society. Fair. Carbon copy letterbooks are faded badly in parts. Created by Lisa Shortall, January 2015. Revised by Lisa Shortall, January 2016.